Trying to cook an egg in the microwave can be a real kitchen nightmare if you don't have the proper equipment. In fact, the mess that an egg can create in a microwave is unforgettable once you experience it. But a microwave egg cooker can help you cook the perfect egg, without the mess and in record time. 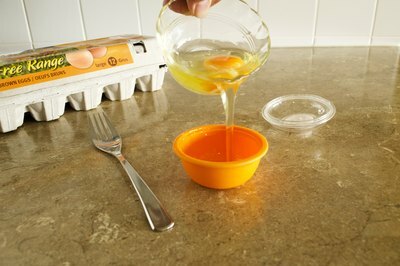 Break one large egg and pour it into the well of the microwave egg cooker. If you prefer, you can even sprinkle a little bit of salt on the bottom of the well to flavor the egg and help it cook more evenly. Poke the egg with a fork a few times to break up the egg. This part is very important when cooking eggs in the microwave because if you forget to do it, the egg will explode and leak out of the egg cooker. You can also use a whisk to give the egg a little whip to help it cook more evenly. 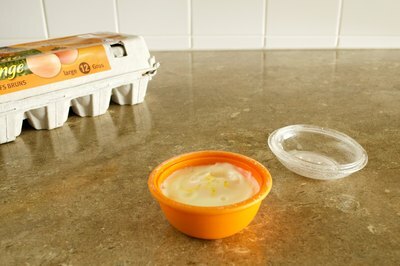 Cover the egg inside the egg well with the lid that is specially made for it. Give it a twist and make sure that it is secure before pressing the start button on your microwave. Cook a scrambled egg on high for approximately 35 seconds. You should give the egg a whipping with the whisk before cooking for best results. Allow the egg to stand for at least 25 seconds before removing it from the egg cooker. 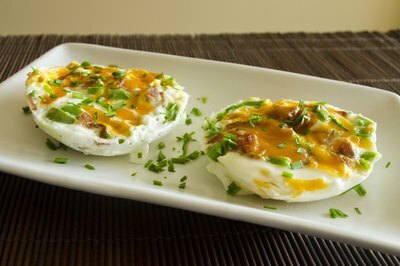 Place the egg cooker in the microwave on high for 30 seconds if you would like to make a soft-cooked egg. The yolk of the soft-cooked egg will have the same texture as that of a soft-boiled egg that you boil on the stovetop. Allow the egg to stand uncovered for 10 seconds before removing it from the cooker. Make a hard-cooked egg by placing it in the microwave and cooking it on high for 40 seconds. The hard-cooked yolk will have the same consistency of a hard-boiled egg. Allow to stand for 10 seconds before removing it from the microwave egg cooker. For some extra flavor, add a small amount of cheese, bacon bits or ham to the top of the egg before you put the lid on to cook it. Peppers also make a flavorful topping for microwave eggs. One of the most important things to remember about cooking an egg in the microwave is to never cook it in its shell. The egg’s shell acts as a sealed container and does not allow steam to escape. When pressure builds, the egg explodes and the result is a disaster that is nearly impossible to clean. If you do not have the lid that goes to the microwave egg cooker, do not cook the egg. You will only be disappointed with the result and the mess that you will create.